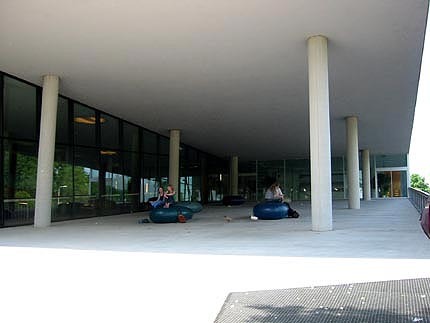 OMA was in charge of the design of the master plan for the De Uithof campus, which is part of Utrecht University. They were also commissioned to design the Educatorium. 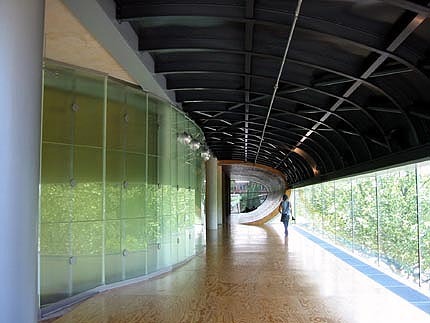 This building is the first University building that OMA ever designed. The Educatorium consists of examination rooms, lecture halls, large public spaces, and a restaurant. 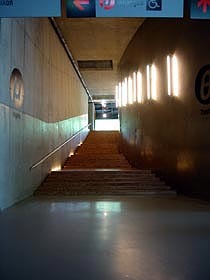 Many of these spaces are created by sloping ramps and floors. 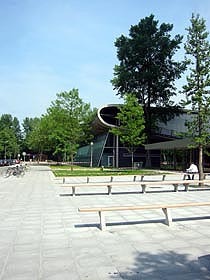 Next to the main entrance, there is a sloped public space with giant bubble sculptures for students to sit on while underneath the slope is space for bike parking. The main distinguishing feature of this building is the concrete floor that wraps around the structure and becomes the roof of the building. 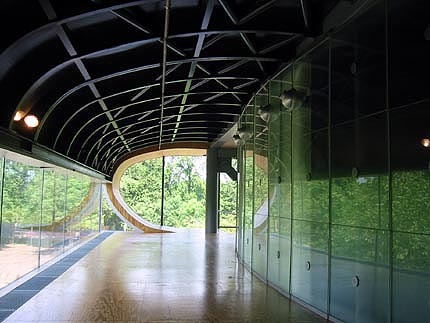 The interior of that curve is finished with wood strips and provides a warm atmosphere for students to gather and sit around the curved floor that turns into wall and ceiling. 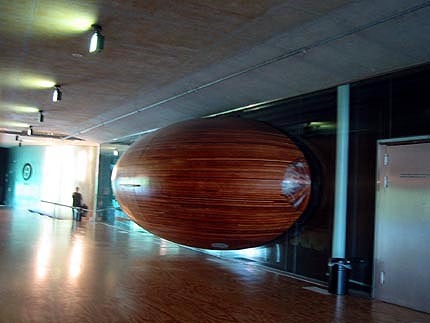 Another interesting feature is the egg-shaped audio visual booth. It is finished on the outside with the same wood strip material. The design of the Educatorium is very environmentally conscious. From the selection of the materials used in the project, to the water supply that is used to flush the toilet, everything is carefully selected to ensure the building is sustainable. Although they are not accessible by the students, roof-top gardens are used for containing rain water in an effort to reduce the sewage load while providing a colorful palette to the building. 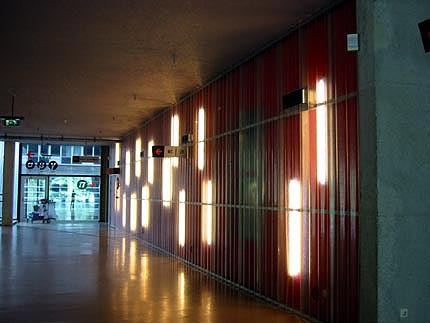 The building is generally open to the public but during certain exam periods, visitors are not allowed inside the building. 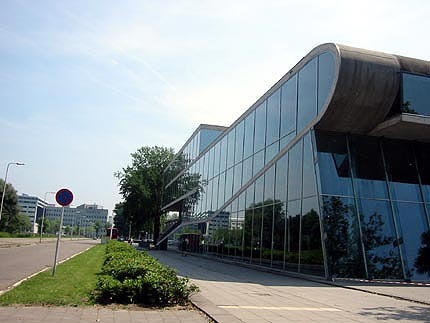 For more information on the building and the accessibility please visit www.uu.nl. To get to and around the University campus, you can take bus city lines number 11 and 12. Also you may ride a bike from the central station. Head east towards Wilhelmina Park. Go through the park and you will be on Prins Hendriklaan. Pass the Schroder House and Prins Hendriklaan will turn into Sophocleslaan. From there make a right on to Platolaan, and then turn left onto Weg Tot de Wetenschap. Follow it and it will lead you to the entrance of the University De Uithof campus. While you are at the University campus, you may also want to visit the Faculty of Economics and Management building designed by Mecanoo, the café with basketball court on top designed by NL Architect, the Minnaert building designed by Neutelings Riedijk Architecten and the Bijvoet Centre for NMR facilities building designed by UN Studio.